A Quick and Easy Fruit Salad made with canned fruit. My young daughter made this for a 4-H Club project. It is simple for young people who are learning to cook. 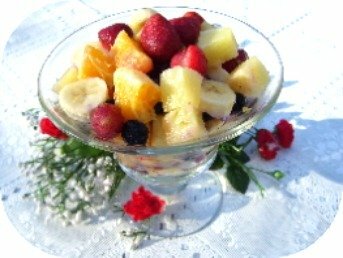 The second recipe is an Antioxidant Fruit Salad and is also quick and easy. It contains an abundance of antioxidants, vitamins C and A, healthy B-complex vitamins, potassium, and other nutrients. Though most fruits contain antioxidants some carry a higher percentage than others. We have selected these fruits for their higher nutrient content. The five fruits I have mixed together gives you an enhanced, fruity flavor to enjoy for breakfast, lunch, dinner or snacks. Chill fruit in refrigerator a few hours before preparing. Place lettuce leaf on a plate. Arrange pear, peach, and pineapple on lettuce with cup side up. Spoon cottage cheese equally in fruit. Place mayonnaise in center of plate. Top with cherry. Sprinkle cheese over all. Peel oranges and separate sections. Cut in half crosswise. Remove seeds if there are any. Place in a large salad bowl. Peel bananas and slice about 1/4 inch thick. Add to bowl. If using frozen berries let them thaw just enough to separate and add to the salad. This helps prevent the brilliant colors from mixing too much. Of course if they do, it will not affect the taste. I make this recipe often by doubling the ingredients and store in canning freezer jars in the refrigerator to use whenever I need a quick low calorie healthy snack. Just let the frozen fruit set at room temperature for awhile. Use this fruit mixture to top breakfast pancakes or waffles. Make a fruit shortcake by topping slices or wedges of plain cake with this fruit and topping off with whipped cream. Yummy! Add other ingredients to bowl and toss gently. Chill if desired and serve. If you enjoy these healthy recipes you may also like my Watermelon Salad. It will make a beautiful presentation layered in a glass salad bowl, if you are in a hurry.